to strive for justice, equality and peace among all people and to respect the dignity of every human being. The programs were created to oversee St. John’s various outreach. The Parish seeks to support persons, organizations and situations in demonstrable need and to express its commitment to its mission through its role in the community. Warren-Washington Food Bank Collection baskets for donations to the Warren-Washington Food Bank are located in the vestibules within St. John's Church. 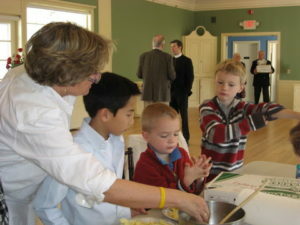 St. John's partnership with Covenant to Care for Children (CCC) in Hartford. 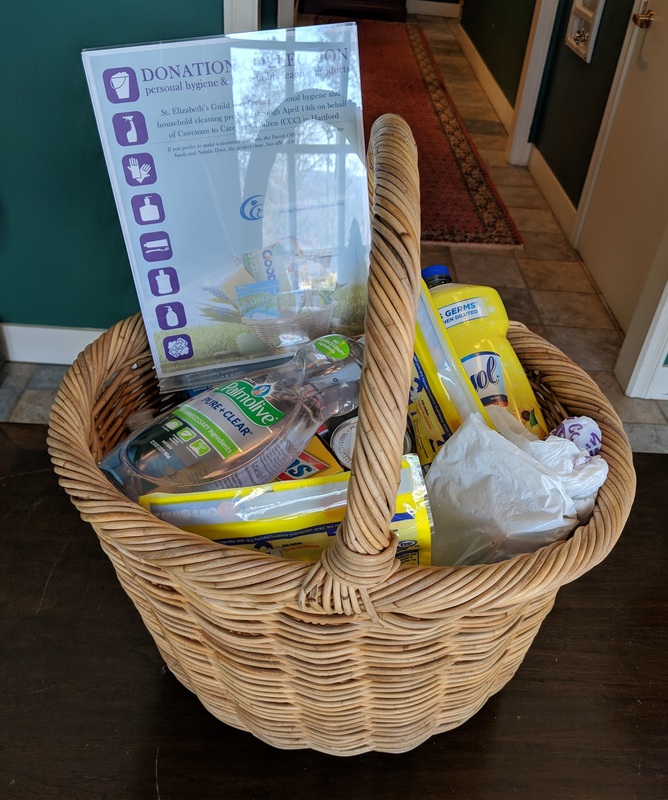 This year, in lieu of Easter Baskets, we've been asked to make donations of personal hygiene and household cleaning products. 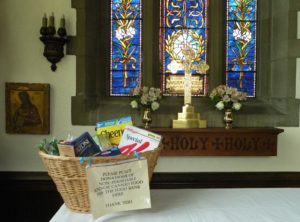 A box has been placed in the Parish Hall to collect contributions through Sunday, April 14th (Palm Sunday). If you prefer to make a monetary donation, the Parish Office will be collecting the funds and Natalie Dyer, the project chair, has offered to shop on our behalf. All donations will be transmitted to Covenant to Care for Children in Hartford for distribution to families in need at Easter. Suggested items include soap, tooth brushes, tooth paste, razors, lotions, shampoo, dish detergent, all-purpose cleaners, Band-Aids, etc. Rarely are new warm socks donated to missions or homeless shelters! The sock drive at St. John's Church collected 147 pairs of new cotton socks to donate to FISH in Torrington. FISH/Friends in Service to Humanity of Northwestern CT's mission is to meet the most basic of human needs - food, shelter and hope. The Outreach committee chose to collect socks because homeless men and women who live in shelters and on the streets spend much of their time outside and are often exposed to bad weather and cold temperatures, leaving many to wear soaking wet socks and shoes for days or weeks at a time. Those conditions can lead to serious infections and ailments. The best way to prevent these types of conditions is to keep feet clean, dry and warm. The St. John's parishioners and their friends supported the program and the socks were delivered to FISH in Torrington. Various community outreach efforts are made as needs arise in the local area. St. John’s Fund: The St. John's Fund, solely supported by the Parish, is administered by the Town of Washington. Its funds are available to assist Washington residents faced with a financial emergency whether it is for food, fuel, medical expenses, or other urgent necessities. St. John's has a partnership with Covenant to Care for Children (CCC) in Hartford and provides personal hygiene and household cleaning products.